MOSCOW, Russia -- A ceasefire is likely to collapse in east Ukraine and Russia could be drawn into a "big war" to cleanse the "sore on its borders", the former leader of the region's pro-Russian separatists said. Former prime minister of the self-proclamed Donetsk People's Republic (DNR) Alexander Borodai speaks during an interview in Moscow, Russia, June 22, 2015. Violence has eased but not halted in east Ukraine under what are known as the Minsk 2 agreements, reached in the Belarussian capital on Feb. 12 after an earlier ceasefire collapsed. Alexander Borodai, a Russian citizen and former journalist for nationalist newspapers who emerged last year as prime minister of the self-proclaimed Donetsk People's Republic (DNR), said he expects the Ukrainian army to launch a new offensive. "To be honest, I expect that the Minsk 2 agreements will not be observed, in the same manner as the Minsk 1 agreements were not," Borodai said in an interview this week in a Moscow restaurant surrounded by former rebel commanders. "And at the end of the day the Ukrainian army will launch an offensive. This is a very probable development ... I am not sure that it will end without a big war, as Russia cannot tolerate this sore on its borders forever." Borodai stepped aside in favor of a local man as the rebel leader last August but is widely believed to have strong political links in Moscow and an open channel to the Donbass region where the war has unfolded in the last 15 months. His leadership of the rebels in the early stages of their rebellion ensured he was often seen on Russian television, and passersby stop him to talk and pat him on the back when they see him on the streets of the Russian capital. He also came to worldwide attention as leader of the rebel movement in the area when Malaysian flight MH-17 was shot down by what Western countries believe was a Russian missile fired from rebel territory. He personally negotiated with Malaysian authorities to turn over the "black box" flight recorders from the airliner and has always denied that rebel forces were responsible for the crash that killed all 298 people on board the plane. The fact that nearly all top figures in the rebel movement at the time were from Russia was awkward for the Kremlin, which maintained that pro-Moscow sentiment was indigenous in eastern Ukraine, and Borodai stepped aside in favor of Alexander Zakharchenko, a former electrician from the area. Though fighting is now less intense in east Ukraine, the death toll has continued to rise and is now more than 6,600, with each side accusing the other of planning a new offensive. 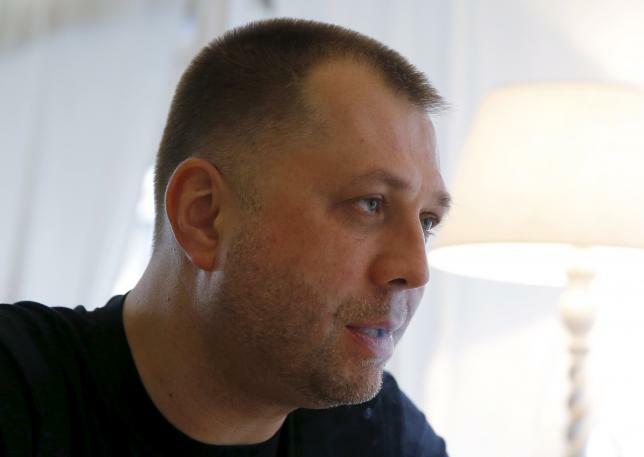 Borodai, 42, said the "half-frozen state" could not continue for long. "A big offensive by the Ukrainian troops will mean many casualties among civilians, I am sorry, as well as among the military ... One cannot say Russia doesn't care about Donbass people. Therefore there is a chance Russia won't leave people in the (rebel-led) republics in need," he said. Asked whether Russian forces could then intervene, he said: "I admit that Russia may lose patience." Kremlin spokesman Dmitry Peskov declined to comment on Borodai's remarks. The West and Kiev say Russia has already sent troops and weapons into east Ukraine to back the separatists but Moscow denies this. Colonel Andriy Lysenko, a Ukrainian military spokesman, said Kiev is abiding by the Minsk agreements and denied Ukrainian government forces were preparing an offensive. Borodai remains in touch with other Muscovites who held prominent roles as rebel leaders in Ukraine, such as Igor Strelkov, who was the main rebel military commander at the time the Malaysian airliner was shot down. Strelkov and Borodai, who fought in Moldova's breakaway Transdniestr region in the 1990s, slipped back into Russia several months ago, deeming their job finished as "patriots" in east Ukraine. Borodai, who is banned under Western sanctions from entering the European Union and the United States, says tightening the sanctions will not "frighten" Moscow. He reiterated that Russia had not sent troops to east Ukraine, adding that if it had "there would have been no trace of the Ukrainian army left close to Donetsk now."